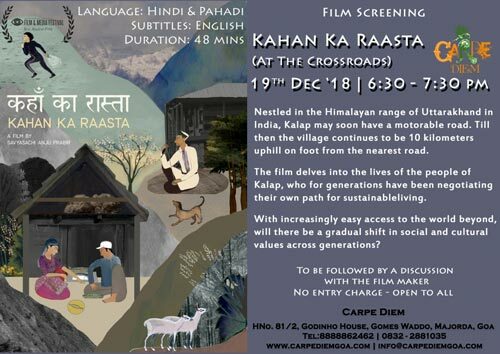 This 19th December immerse yourself in the movie Kahan Ka Raasta (At The Crossroads) as the director Savyasachi Anju-Prabir takes us through the journey of the lives of the people in the Himalayan roadless village of Kalap. world beyond, will there be a gradual shift in social and cultural values across generations? Kahan Ka Raasta is an immersive journey,in time and space, into the everyday reality of Kalap. It transpires at the pace of the village life, to unveil its many facets. Discussion with the director to follow post screening.